The first regional meeting of delegates from various sectors and struggles in the Caribbean to construct a Regional Peace Assembly was held on Saturday [May 30] in the city of Cartagena,. The meeting was supported by the workers’ labor union -USO- and the company Ecopetrol. 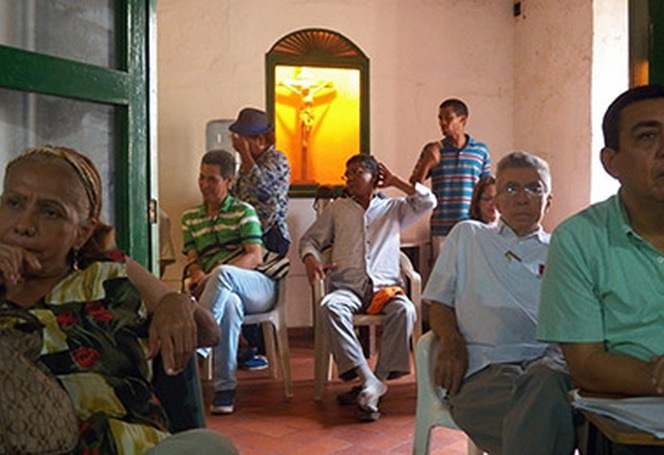 It was attended by delegates from Atlantico, Bolivar, Sucre, Córdoba, Cesar and Guajira. The main objective was the planning and coordination of facilitator teams in each department to develop departmental assemblies prior to a Regional Assembly for Peace. The organizers of the meeting consider that the meeting met with full success. The Assembly takes place in the framework of the dialogue between the government and insurgent groups, which takes place in Havana between the Revolutionary Armed Forces -FARC- of Colombia which is of great importance for the country. The convening organizations expect the second Regional Assembly to have a wide participation “in which converge all social sectors present in the territories in order to collect the path of actions towards peace with social justice, peace with changes the country is yearning for. ” They added that in every department of the Caribbean region will have a coordinating team that can approach organizations that wish to participate in the initiative. Themes considered in the Assembly included mining and energy policies, regional development and assistance to education. Finally, the culture of peace and followup of the agreements. The USO has historically worked on building peace through regional initiatives, especially in the city of Barrancabermeja. It has also promoted national proposals and the Assembly for Peace, held in conjunction with Ecopetrol in 1996. The union has led in the development of multiple initiatives such as the Assembly of Workers for Peace as an autonomous space in which proposals were collected from different sectors for the country in relation to the transformations necessary for peace. In 2012, the USO and Ecopetrol signed an agreement for the implementation of the Second National Assembly for Peace, which for various reasons, could not take place until this year. The USO-Ecopetrol team, responsible for conducting the Assembly will feature an expert panel for permanent consultation including professors Alejo Vargas, Victor Currea, Francisco de Roux and Hernando Salazar.